"Post code" redirects here. For computer POST codes, see Power-on self-test. A postal code (also known locally in various English-speaking countries throughout the world as a postcode, post code, Eircode, PIN or ZIP Code) is a series of letters or digits or both, sometimes including spaces or punctuation, included in a postal address for the purpose of sorting mail. 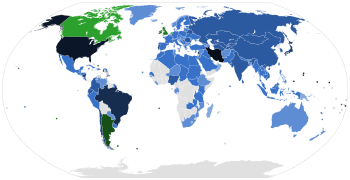 In February 2005, 117 of the 190 member countries of the Universal Postal Union had postal code systems. Although postal codes are usually assigned to geographical areas, special codes are sometimes assigned to individual addresses or to institutions that receive large volumes of mail, such as government agencies and large commercial companies. One example is the French CEDEX system. There are a number of synonyms for postal code; some are country-specific. CAP: The standard term in Italy; CAP is an acronym for codice di avviamento postale (postal expedition code). CEP: The standard term in Brazil; CEP is an acronym for código de endereçamento postal (postal addressing code). Eircode: The standard term in Ireland. NPA in French-speaking Switzerland (numéro postal d'acheminement) and Italian-speaking Switzerland (numero postale di avviamento). PIN: The standard term in India; PIN is an acronym for Postal Index Number. Sometimes redundantly called a PIN code. PLZ: The standard term in Germany, Austria, German-speaking Switzerland and Liechtenstein; PLZ is an abbreviation of Postleitzahl (postal routing number). Postal code: The general term is used in Canada. Postcode: This solid compound is popular in many English-speaking countries and is also the standard term in the Netherlands. ZIP code: The standard term in the United States and the Philippines; ZIP is an acronym for Zone Improvement Plan. The development of postal codes reflects the increasing complexity of postal delivery as populations grew and the built environment became more complex. This happened first in large cities. Postal codes began with postal district numbers (or postal zone numbers) within large cities. London was first subdivided into 10 districts in 1857, and Liverpool in 1864. By World War I, such postal district or zone numbers existed in various large European cities. They existed in the United States at least as early as the 1920s, possibly implemented at the local post office level only (for example, instances of "Boston 9, Mass" in 1920 are attested,) although they were evidently not used throughout all major US cities (implemented USPOD-wide) until World War II. By 1930 or earlier the idea of extending postal district or zone numbering plans beyond large cities to cover even small towns and rural locales was in the air. These developed into postal codes as they are defined today. The name of US postal codes, "ZIP codes", reflects this evolutionary growth from a zone plan to a zone improvement plan, "ZIP". 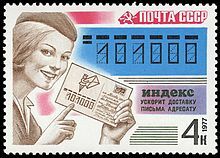 Modern postal codes were first introduced in the Ukrainian Soviet Socialist Republic in December 1932, but the system was abandoned in 1939. The next country to introduce postal codes was Germany in 1941, followed by Singapore in 1950, Argentina in 1958, the United States in 1963 and Switzerland in 1964. The United Kingdom began introducing its current system in Norwich in 1959, but they were not used nationwide until 1974. The Arabic numerals "0" to "9"
Postal codes in the Netherlands originally did not use the letters 'F', 'I', 'O', 'Q', 'U' and 'Y' for technical reasons. But as almost all existing combinations are now used, these letters were allowed for new locations starting 2005. The letter combinations "SS" (Schutzstaffel), "SD"(Sicherheitsdienst), and "SA" (Sturmabteilung) are not used for historical reasons. it also helps to avoid accidental doubles-entendres by avoiding the creation of word look-alikes, as Eircode's last 4 characters are random. Most of the postal code systems are numeric; only a few are alphanumeric (i.e., use both letters and digits). Alphanumeric systems can, given the same number of characters, encode many more locations. For example, while a 2 digit numeric code can represent 100 locations, a 2 character alphanumeric code using ten numbers and twenty letters can represent 900 locations. Peru (see table) The postal code format in Peru was updated in February 2011 to be of the format of five digits. Countries which prefix their postal codes with a fixed group of letters, indicating a country code, include Andorra, Azerbaijan, Barbados, Ecuador and Saint Vincent and the Grenadines. ISO 3166-1 alpha-2 country codes were recommended by the European Committee for Standardization as well as the Universal Postal Union to be used in conjunction with postal codes starting in 1994, but they have not become widely used. Andorra, Azerbaijan, Barbados, Ecuador, Latvia and Saint Vincent and the Grenadines use the ISO 3166-1 alpha-2 as a prefix in their postal codes. In some countries (such as in continental Europe, where a numeric postcode format of four or five digits is commonly used) the numeric postal code is sometimes prefixed with a country code when sending international mail to that country. Postal services have their own formats and placement rules for postal codes. In most English-speaking countries, the postal code forms the last item of the address, following the city or town name, whereas in most continental European countries it precedes the name of the city or town. When it follows the city it may be on the same line or on a new line. In Belarus, Kyrgyzstan, Russia, Turkmenistan it is written at the beginning of an address. Postal codes are usually assigned to geographical areas. Sometimes codes are assigned to individual addresses or to institutions that receive large volumes of mail, e.g. government agencies or large commercial companies. One example is the French Cedex system. Before postal codes as described here were used, large cities were often divided into postal zones or postal districts, usually numbered from 1 upwards within each city. The newer postal code systems often incorporate the old zone numbers, as with London postal district numbers, for example. Ireland still uses postal district numbers in Dublin. 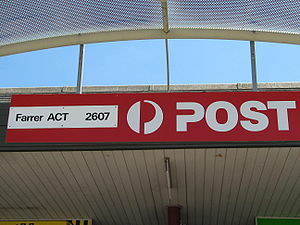 In New Zealand, Auckland, Wellington and Christchurch were divided into postal zones, but these fell into disuse, and have now become redundant as a result of a new postcode system being introduced. Some postal code systems, like those of Ecuador and Costa Rica, show an exact agreement with the hierarchy of administrative country subdivisions. CC - one of the parishes of Ecuador. CC - one of the districts of Costa Rica. In Costa Rica these codes are also used by the National Institute for Statistics and Census (INSEC). The first two digits of the postal codes in Turkey correspond to the provinces and each province has assigned only one number. They are the same for them as in ISO 3166-2:TR. The first two digits of the postal codes in Vietnam indicate a province. Some provinces have one, other have several two digit numbers assigned. The numbers differ from the number used in ISO 3166-2:VN. Map of Brazilian 5-digit postalcodes of São Paulo state. Each color shows a set of administrative areas, and the hierarchy of codes relating indirectly to them. In France the numeric code for the departments is used as the first two digits of the postal code, except for the two departments in Corsica that have codes 2A and 2B and use 20 as postal code. Furthermore, the codes are only the codes for the department in charge of delivery of the post, so it can be that a location in one department has a postal code starting with the number of a neighbouring department. The first digit of the postal codes in the United States defines an area including several states. From the first three digits (with some exceptions), one can deduce the state. Similarly, in Canada, the first letter indicates the province or territory, although the provinces of Quebec and Ontario are divided into several lettered sub-regions (e.g. H for Montreal and Laval), and the Northwest Territories and Nunavut share the letter X. The first two digits of the postal codes in Germany define areas independently of administrative regions. The coding space of the first digit is fully used (0-9); that of the first two combined is utilized to 89%, i.e. there are 89 postal zones defined. Zone 11 is non-geographic. Royal Mail designed the postal codes in the United Kingdom mostly for efficient distribution. Nevertheless, people associated codes with certain areas, leading to some people wanting or not wanting to have a certain code. See also postcode lottery. In Brazil the 8-digit postcodes are an evolution of the 5-digit area postal codes. In the 1990s the Brazilian 5-digit postal code (illustrated), DDDDD, received a 3-digit suffix DDDDD-SSS, but this suffix is not directly related to the administrative district hierarchy. The suffix was created only for logistic reasons. City blocks surrounded by streets, some streets with a different 8-digit postal code (suffixes 001 to 899). Faces of a city block and their extension into its interior. Each color is an 8-digit postal code, usually assigned to a side (odd or even numbered) of a street. Faces of a city block and their extension between city blocks. The same colors (polygons) indicate the same postal codes. The postal code assignment can be related to a land lot in the case of special codes assigned to individual land lots (of large receivers). In any other case it is an error to associate the postal code with the whole land lot area: a lot may have no or more than one delivery point. A postal code is often related to a land lot, but this is not always the case. Postal codes are usually related to access points on streets. Small or middle-sized houses, in general, only have a single main gate which is the delivery point. Parks, large businesses such as shopping centres, and big houses, may have more than one entrance and more than one delivery point. So the semantic of an address and its postal code can vary, and one land lot may have more than one postal code. In Brazil only the suffixes 900-959, that designate large post-receivers, can be assigned to lots. A code corresponds to a local postal office. However, some larger companies or organizations have their own post codes. In 2004–2006 there were some efforts in Slovakia to reform the system, to get separate post codes for every district of single postmen, but the change was not realized. There are 9 total zones consisting of 8 regional zones and 1 functional zone which are represented by the first digit. The first three digits are the routing key, which is a postal district and the last four characters are a unique identifier which relates to an individual address (business, house or apartment). A fully developed API is also available for integrating the Eircode database into business database and logistics systems. Postal codes in the Netherlands, known as postcodes, are alphanumeric, consisting of four digits followed by a space and two letters (NNNN AA). Adding the house number to the postcode will identify the address, making the street name and town name redundant. For example: 2597 GV 75 will direct a postal delivery to Theo Mann-Bouwmeesterlaan 75, 's-Gravenhage (the International School of The Hague). Since 1 September 1995, every building in Singapore has been given a unique, six-digit postal code. For domestic properties, an individual postcode may cover up to 100 properties in contiguous proximity (e.g. a short section of a populous road, or a group of less populous neighbouring roads). The postcode together with the number or name of a property is not always unique, particularly in rural areas. For example, GL20 8NX/1 might refer to either 1 Frampton Cottages or 1 Frampton Farm Cottages, roughly a quarter of a mile (400 metres) apart. There are always two halves: the separation between outward and inward postcodes is indicated by one space. The outward postcode covers a unique area and has two parts which may in total be two, three or four characters in length. A postcode area of one or two letters, followed by one or two numbers, followed in some parts of London by a letter. The outward postcode and the leading numeric of the inward postcode in combination forms a postal sector, and this usually corresponds to a couple of thousand properties. Larger businesses and isolated properties such as farms may have a unique postcode. Extremely large organisations such as larger government offices or bank headquarters may have multiple postcodes for different departments. There are about 100 postcode areas, ranging widely in size from BT which covers the whole of Northern Ireland to ZE for Shetland. Postcode areas may also cross national boundaries, such as SY which covers a large, predominantly rural area from Shrewsbury and Ludlow in Shropshire, England, through to the seaside town of Aberystwyth, Ceredigion on Wales' west coast. In the United States, the basic ZIP Code is composed of five numbers. The first three numbers identify a specific sectional center facility—or central sorting facility—that serves a geographic region (typically a large part of a state). The next two numbers identify either an area of a city (if in an urban area) or a village/town (if in a suburban/rural area). There is an extended format of the ZIP Code known as the ZIP+4, which contains the basic five-digit ZIP Code, followed by a hyphen and four additional digits. These digits identify a specific delivery route, such as one side of a building, a group of apartments, or several floors of a large office building. Although using the ZIP+4 offers higher accuracy, addressing redundancy, and sorting efficiency within the USPS, it is optional and not widely used by the general public. It is primarily only used by business mailers. For high volume business mailers using automated mailing machines, the USPS has promulgated the Intelligent Mail barcode standard, which is a barcode containing the ZIP+4 code plus a two digit delivery point. This 11-digit number is theoretically a unique identifier for every address in the country. French overseas departments and territories use the five-digit French postal code system, each code starting with the three-digit department identifier. Monaco is also integrated in the French system and has no system of its own. The British Crown dependencies of Guernsey, Jersey and the Isle of Man are part of the UK postcode system. They use the schemes AAN NAA and AANN NAA, in which the first two letters are a unique code (GY, JE and IM respectively). Most of the Overseas Territories have UK-style postcodes, with a single postcode for each territory or dependency, although they are still treated as international destinations by Royal Mail in the UK, and charged at international rather than UK inland rates. The four other Overseas Territories Anguilla, Bermuda, British Virgin Islands and Cayman Islands have their own separate systems and formats. The Pacific island states of Palau, Marshall Islands and the Federated States of Micronesia remain part of the US ZIP code system, despite having become independent states. San Marino and the Vatican City are part of the Italian postcode system, while Liechtenstein similarly uses the Swiss system, as do the Italian exclave of Campione d'Italia and the German exclave of Büsingen am Hochrhein, although they also form part of their respective countries' postal code systems. The Czech Republic and Slovakia still uses the codes of the former Czechoslovakia, their ranges not overlapping. In 2004–2006, Slovakia prepared a reform of the system but the plan was postponed and maybe abandoned. In Czechia, there was no significant effort to modify the system. In the United Kingdom, the non-conforming postal code GIR 0AA was used for the National Girobank until its closure in 2003. A non-geographic series of postcodes, starting with BX, is used by some banks and government departments. Previously, the postcode SAN TA1 was used. In Finland the special postal code 99999 is for Korvatunturi, the place where Santa Claus (Joulupukki in Finnish) is said to live, although mail is delivered to the Santa Claus Village in Rovaniemi. Finding the nearest branch of an organisation to a given address. A computer program uses the postal codes of the target address and the branches to list the closest branches in order of distance as the crow flies (or, if used in conjunction with streetmap software, road distance). This can be used by companies to inform potential customers where to go, by job centres to find jobs for job-seekers, to alert people of town planning applications in their area, and a great many other applications. Fine-grained postal codes can be used with satellite navigation systems to navigate to an address by street number and postcode. Geographical sales territories for representatives in the pharmaceutical industry are allocated based on a workload index that is based upon postcode. The availability of postal code information has significant economic advantages. In some countries, the postal authorities charge for access to the code database. As of January 2010[update], the United Kingdom Government is consulting on whether to waive licensing fees for some geographical data sets (to be determined) related to UK postcodes. ^ Lynd-Farquhar Co (1920). "Advertisement for machine tools, 1920". American Machinist: 388. ^ Hill, Clarke & Co, Inc (1920). "Advertisement for a drill press, 1920". American Machinist: 389. ^ "The First Postal (ZIP) Code in the World". Ukrainian Philatelic and Numismatic Society. 2009-04-20. Archived from the original on 2010-04-23. Retrieved 2010-03-04. ^ "The history of the postcode". Deutsche Post. Archived from the original on 2011-07-16. Retrieved 2010-10-10. ^ a b Chia, Joshua (13 July 2016). "Six-digit postal code system". Singapore Infopedia. National Library Board. Retrieved 3 October 2018. ^ "ZIP (Zone Improvement Plan) Code". International Paper Company. Archived from the original on 2009-11-19. Retrieved 2010-10-10. ^ "Company History: Schweizerische Post-Telefon-und-Telegrafen-Betriebe". Funding Universe. Archived from the original on 2011-09-09. Retrieved 2010-10-10. ^ "A short history of the postcode". The Independent. Archived from the original on 2011-02-25. Retrieved 2014-06-25. ^ "GreatData.com (a licensee of Canada Post data)". Archived from the original on 2 April 2013. Retrieved 8 February 2013. ^ "Post Code Project Suspended Indefinitely". Press Release 07 published in Daily Gleaner. Jamaica Post. 2007-02-12. Archived from the original on 2010-02-26. Retrieved 2010-03-04. ^ da Cruz, Frank (2008-05-17). "Frank's Compulsive Guide to Postal Addresses". Columbia University. Archived from the original on 2008-07-25. Retrieved 2008-06-04. ^ "BS7666 Address". Data Standards Catalogue. UK National Archives. 2 October 2009. Archived from the original on 28 January 2013. Retrieved 15 August 2015. ^ "VAT: insolvency". www.gov.uk. Archived from the original on 6 January 2018. Retrieved 2 May 2018. ^ Canada Post (27 January 2007). "Over one million children write letters to Santa". Archived from the original on 9 April 2010. Retrieved 27 April 2009. ^ "Ook dit jaar, helpt bpost de Sint". bpost.be. bpost. Retrieved 2 May 2018. ^ "Cette année également, bpost apporte son aide à Saint-Nicolas". bpost.be. bpost. Retrieved 2 May 2018. ^ Charles Arthur. "Guardian newspaper article on postcodes". Theguardian.com. Archived from the original on 2017-12-01. Retrieved 2018-02-26. This page was last edited on 7 April 2019, at 20:05 (UTC).